You’re bound to have seen rodeo bulls, but have you ever thought about hiring a rodeo bull for your event? Rodeo bulls, or bucking broncos as they’re sometimes called, always create a stir! Your guests will be encouraged to climb aboard the bull and try to hold on for as long as possible while the bull bucks and jolts around its axis. 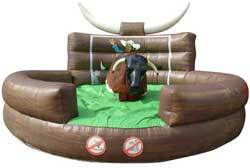 Our rodeo bull hire comes complete with covers and spotlights if you need them; great for a wild west themed party! Are you booking for a Christmas party? Then how about hiring a rodeo Rudolf? Perfect for private, corporate and commercial Christmas parties and events! We can also supply an inflatable snowboard simulator too for a double measure of festive entertainment! We can also supply you with rodeo rugby ball, surf simulators and surfing Sinbad, as well as many other outdoor entertainment such as bouncy castles, inflatables and giant outdoor games. Please contact our office directly for all your rodeo bull hire requests. We’ll be happy to discuss your event with you and talk you through any other forms of entertainment you might want to consider.